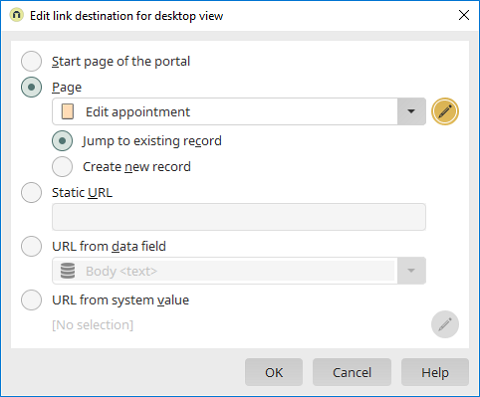 The portal start page is used as the link destination. A view or edit page can be selected as the link destination here. Opens a dialog where the parameters, which are demanded by the integrated page, can be created. This option is available if an edit page has been selected. The edit page will be loaded with the data from the current data record. This option is also available if an edit page has been selected. The edit page will be loaded without data so that a new data record can be added. A static target URL can be entered here. A data field can be selected here that contains the target URL. With this value, a system value that provides a target URL can be used. The currently selected system value type is shown here.